We welcome Denise Henry as the new Executive Director for SARAH, Inc., succeeding Pat Bourne who announced her retirement earlier this year. Denise has been Associate Director at SARAH, Inc. for four years with more than three decades of experience in the field. During the course of her career, she has worked extensively as a behavioral clinician, in quality assurance, project management and the programmatic oversight for residential, day and employment services. She earned her undergraduate and graduate degrees in psychology at the University of Leiden in the Netherlands. 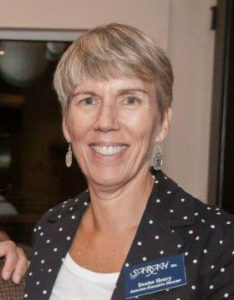 Pat Bourne has served as Executive Director of SARAH, Inc. since 2006. During her tenure, SARAH, Inc. has expanded its reach, providing supports and services to more than 600 children and adults with differing abilities. 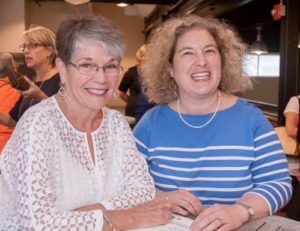 While Denise will officially assume her responsibilities in November, Pat will continue in a consulting role and work closely with Denise over the next several months to ensure a smooth and successful transition. SARAH – Yesterday, Today and Tomorrow – is the theme of our year- long celebration of 60 years of service. 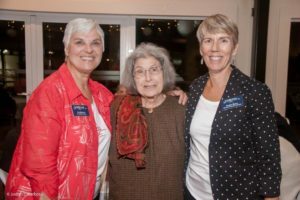 The SARAH Appreciation Night on 10/5/17 at the Stony Creek Brewery was an opportunity for SARAH to thank our many donors, sponsors, patrons and friends for their support over these many years. We were proud to pay tribute to the early “pioneers” whose vision and determination changed the world for their children – and all children – with differing abilities. 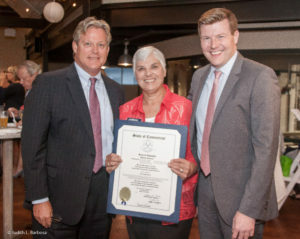 From its humble beginnings as a school run by volunteers in the basement of a local church, SARAH, Inc. now serves over 600 children and adults with differing abilities in communities throughout Connecticut. We are pleased to announce that, on or about December 1, 2017, our KIDSTEPS administrative offices will relocate to the new Clifford Beers Autism Center at 43 Marne St. in Hamden. KIDSTEPS will have its own offices at the center and we will be able to share the communal space and many of the resources available at this newly designed, state of the art autism center. The Clifford Beers Marne St. Clinic offers comfort, community and consistency in a sensory friendly environment to promote social inclusion for children with differing abilities. Transition plans are still in development and we will keep you informed on our progress as information is available. We ask for your patience and cooperation as we make these transitions. Working together as a team, we will ensure KIDSTEPS continues to provide quality services with minimal disruptions for everyone involved. Stay tuned! Elisabeth Teller, Director of SARAH, Inc. KIDSTEPS Children Services, has been reappointed to the CT Interagency Birth to Three Coordination Council by Governor Malloy. The CT Interagency Birth to Three Coordination Council (ICC) consists of representative members appointed by the Governor and leaders of the State House of Representatives and State Senate. The council’s role is to advise and assist the lead agency (Office Of Early Childhood) in the implementation of the Birth to Three System. KIDSTEPS is the children’s division of SARAH Inc. and is a Birth to Three early intervention program serving infants and toddlers with developmental delays. The KIDSTEPS service region encompasses 31 towns throughout southern and eastern Connecticut. Our professional staff of certified therapists, early childhood specialists and teachers offers therapeutic consultation, treatment and counseling to families to help them meet their children’s developmental goals. Services are provided exclusively in natural environments such as family’s homes, child care settings, and community locations. Service Coordination is given to each family to assist them with making connections to community resources including transitioning. SARAH in North Haven and students from the CT Experiential Learning Center (CELC) are volunteering together at the Whiffen Farm, a family-owned farm, in East Haven. Together, SARAH participants and the CELC students are learning farming operations and animal care through hands on work . This volunteer experience is a great learning opportunity and a chance for everyone involved to make new friends. SARAH is proud to partner with CELC. CT Experiential Learning Center (CELC) Middle School of Branford provides an energizing, personalized, and significant middle school experience. Students come from a variety of towns throughout Connecticut, from families looking for a program that engages and deepens learning, where their children thrive during these important and impactful 5th – 8th grade years. 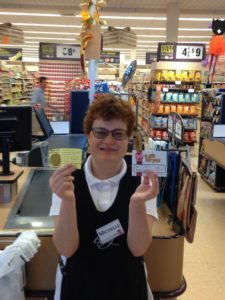 Recently, Big Y in Guilford conducted a contest asking customers to complete a ballot identifying the name of their bagger and to rate their performance. This contest applied to all Big Y employees. Congratulations to Michelle for a job well done! Dozens of SARAH, Inc. supported workers are employed in retail, service and manufacturing jobs throughout the community. Workers can be independently employed with occasional supports as needed or can be supervised and trained by a coach as they ease into a new job. Supports are customized to meet each person’s interests or needs. SARAH, Inc. also provides students, schools and families with extensive transition planning and supports to ensure that students with special needs and other differing abilities have a variety of work experiences to enhance their career development. Do you know a business who could benefit from hiring another hard working and dedicated employee like Michelle? 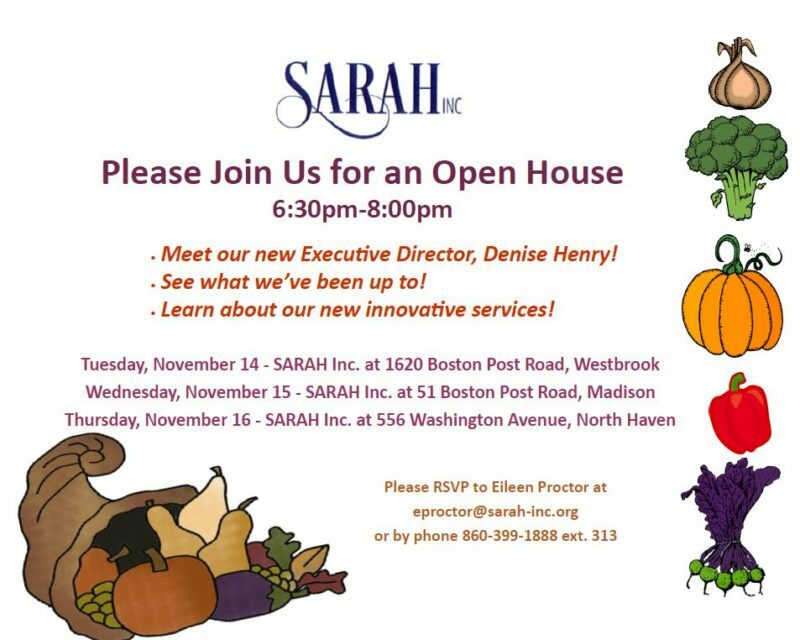 Call or contact Jen Kostek, Director of Employment Services at jkostek@sarah-inc.org or at 860-399-1888, ext 311). As we go to press and after months of delays and negotiations, the Governor has just signed a bipartisan biennial budget. There is much about this budget we do not know and there are still many implementation details still to be worked out. However, we do know that this approved budget restores Employment and Day funding for 2017 and 2018 graduates. There is also funding for the ID Partnership, a DDS systems change initiative introduced by Governor Malloy to address residential waiting list and rate stabilization for providers. This budget also restores funding to the Birth to Three early intervention services and keeps the Birth to Three program under the administration of the Office of Early Childhood. 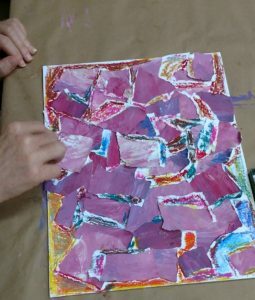 There are still many uncertainties and it is unclear what the final level of funding both DDS and DSS (which administers the Medicaid Waiver) will receive to support services for people with I/DD. We do know that the countless hours of testimony, lobby days, press conferences and thousands of emails and phone calls made a difference. We thank our legislators for their collaborations and bipartisan commitment to the people we serve. We must remain vigilant as this process evolves and we will keep you informed as information is available. Thank you for raising your voice on these most important issues! SARAH, Inc. relies on the generosity and support of our families, friends and our communities to carry out our mission to “enhance skills and enrich the lives of individuals with differing abilities in our community”. How can you help? We ask you to get involved in the way that best works for you. Donate your time, talent and treasures to help us continue to do what we do for the people we serve. For more information on how you can help, contact Denise Henry, Executive Director, at dhenry@sarah-inc.org or at 860-399-1888, ext. 308. So, what do you think of our newsletter? What else would you like to know? We will add a few comments every newsletter. Also, know that this is NOT a printed newsletter, although you are welcome to print yourself a copy. Please share this with others! We will be sending this electronically, posting a link on Facebook, and posting on our website. Please be sure we have your current email address. We want to hear from you!